I have never in my life been the kind of person who dresses up my meals with bold flavors. In fact, if there were a way to take a delicious dish and turn the flavor volume way down, I would have found a way to do it. For years, I have eaten plain spaghetti without a hint of sauce, oil, or garlic on it. I enjoyed gravy-less mashed potatoes, toppingless pizza, and dressing-on-the-side salads into my twenties. But now, all of a sudden, I want spices and seasoning on every single thing I eat. Hot sauce? Pour it on. Garlic salt? Keep it coming. Your guess is as good as mine when it comes to explaining why my tastebuds did a sudden switcheroo, but the spices collection at Trader Joe’s is definitely to thank for me continuing to doctor up my meals. 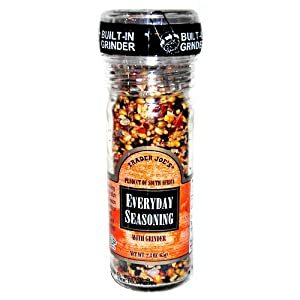 I first picked up a convenient Everyday Seasoning grinder from the store because it was made in South Africa, a place I traveled to in college. I was curious about the blend of ingredients, even though I wasn’t sure exactly how to use them. As it turns out, it’s incredibly easy to just shake a few flakes of the rich, peppery topping onto anything basic you’re cooking to make it feel more gourmet. I’ve topped noodles, vegetables, and soups with the blend, and even if you’re making something out of a box, it tastes homemade! The Lemon Pepper grinder is great for adding a hint of cirtus to your meals, and since it’s perfectly pre-blended, you don’t have to worry about going overboard with the sour. My family uses it to top fish and chicken dishes for a little added zing. My newfound personal favorite is the Trader Joe’s Garlic Salt blend, which is somehow more delicious than other brands’ mixes. It’s not just shakeable garlic powder: it’s mixed with dried green herbs like parsley and a little bit of onion for added flavor! All of the spices are less than $2 so it’s easy and affordable to sample a few and find out what works for your own cooking. You can’t go wrong with any of them since they have the grinders built into the tops so you can have the taste of fresh-ground herbs and spices each time you use them! Having used a variety of these blends, I can attest to how great they can make something ordinary taste.